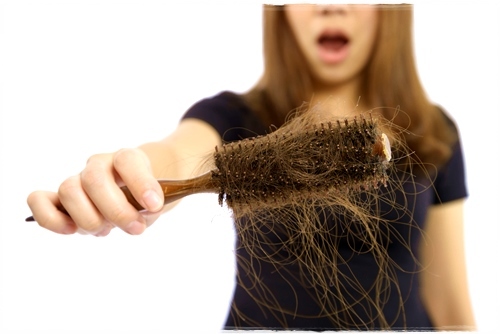 When it comes to hair loss, the first thing you should determine is whether your problem appears as a result of some medical issue or it has to do with a hereditary factor. In the first case, you should turn to your doctor, but if hereditary nature is in question, then, unfortunately, there is very little you can do but accept the fact that genes cannot be changed. However, don’t get discouraged because in some cases you can, at least, lessen the problem or slow down the whole process. Whatever the case, the problem should be addressed ASAP! Furthermore, watch for your dietary habits and ensure your body has a sufficient daily intake of vitamins and minerals. Moreover, a tip you have probably got sick of listening to, but it is inevitable: stop smoking! Studies have shown that smoking accelerates hair loss. Therefore, if you want to do something about it, toss those cigarettes once and for all. Besides, your problem can be tackled with the help of nature, that is – herbal remedies. Take 20 tablespoons of stinging nettle and put it in 1 l of water. Add 0.5 l of fruit vinegar and cook for 30 minutes. Drain afterwards and massage into the scalp every evening. In order to prevent hair loss, massage the fish oil into your scalp and the roots of your hair. Take 4 tablespoons of chamomile and cover with 0.5 l of boiling water and leave it to sit for an hour. Drain and use the liquid to wash your hair and massage the scalp. Apply 2 times a week before bed in a combination with the castor oil. Drink each day one brewer’s yeast for a longer period of time. Slice 4 red onions and cover with little water. Leave it to sit for 36 hours and then squeeze the water from the red onion and drain. Apply this liquid on your scalp using a cotton ball. Use gauze soaked in the liquid to wrap around your head and repeat the procedure as many times as necessary. Put 15 teaspoons of chopped nettle leaves into 1 l of boiling water, cover it and leave to sit for some 2 hours. Then heat the mixture without boiling it and add 5 teaspoons of chamomile and leave it to sit for another 2 hours. Drain well afterwards and add 300 ml of vinegar and stir. Work this lotion into your scalp using fingertips and carefully massage it into the scalp and stroke the lotion along the length of your hair as well. Burdock root tea is a very efficient when it comes to hair care and stimulating hair growth. The scalp should be thoroughly washed with the tea followed by a massage with burdock oil 3 times a week. Cut into pieces a handful of dried burdock root and cover it with some alcohol. Put the mixture into a bottle. About 6 – 8 days later add ½ – ¾ of oil and leave it in a warm place for 3 – 4 weeks and shake it every day. Close the bottle and seal it with a pierced napkin so the alcohol could evaporate.